Joy McCracken has broken all ties with her life in New York and a well-paid job with a fashion magazine. She hasn’t come to terms with the crib death of her four-month-old son and continues to hold herself responsible, despite the efforts of her psychiatrist to convince her otherwise. Buy the Book! 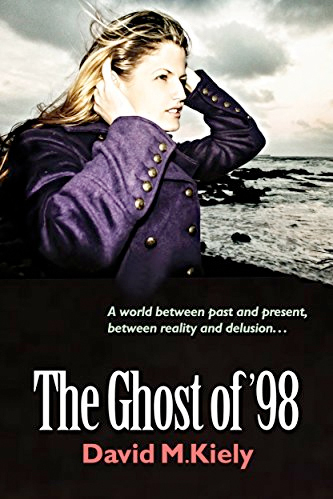 It’s July 1998 and Joy is making a pilgrimage in Northern Ireland, the country of her ancestors. She’s following in the footsteps of her namesake, Henry Joy McCracken, who led a revolt here two hundred years before. Her journey takes her along the eastern coastline and brings her into contact with a number of people, from the genuinely pleasant to the decidedly odd. Joy McCracken’s goal seems at first glance a morbid one—she plans suicide. She sees this as a release from the demons that pursue her. With death approaching, Joy has never felt so alive. Against a backdrop of civil unrest—events that touch Joy only marginally, if at all—she discovers a world that lies between past and present. It’s a twilight world peopled by restless ghosts—many of her own making. The novel is an imagining of Vinland, the territory that could have developed had Leif Erikson, the Viking, and his people chosen to remain in the America they discovered in about AD 1002. David M. Kiely was born in Dublin in 1949. He worked in advertising as an art director and copywriter before turning to book authoring in 1993. His fourteen books include John Millington Synge: A Biography (Dublin, Gill and Macmillan, 1994 / New York, St Martin’s Press, 1995); A Night in the Catacombs: Fictional Portraits of Ireland’s Literati (Dublin, The Lilliput Press, 1995); The Angel Tapes (Belfast, Blackstaff Press / New York, St Martin’s Press, 1997); Bloody Women: Ireland’s Female Killers (Dublin, Gill & Macmillan, 1999); Deadlier Than the Male (Gill & Macmillan, 2005); The Dark Sacrament: Exorcism in Modern Ireland (Gill & Macmillan, 2006 / San Francisco, HarperOne, 2007, co-written with Christina McKenna, author of The Spinster Wife, The Misremembered Man, and others); More Bloody Women (Dublin, Poolbeg, 2009); The Epic of Mesopotamia (Newry, Parsifal Press, 2015), which deals with the Turkish genocide of the Armenians and Assyrians in 1915; Baron Livingstone and the King of Manhattan (Newry, Parsifal Press, 2015) and The Faustian Gambit: A Tale of the Praeternatural (Newry, Parsifal Press, 2015). His latest work of fiction is the detective novel Eyeless in Cooley (Newry, Parsifal Press, 2017), a sequel to The Angel Tapes.